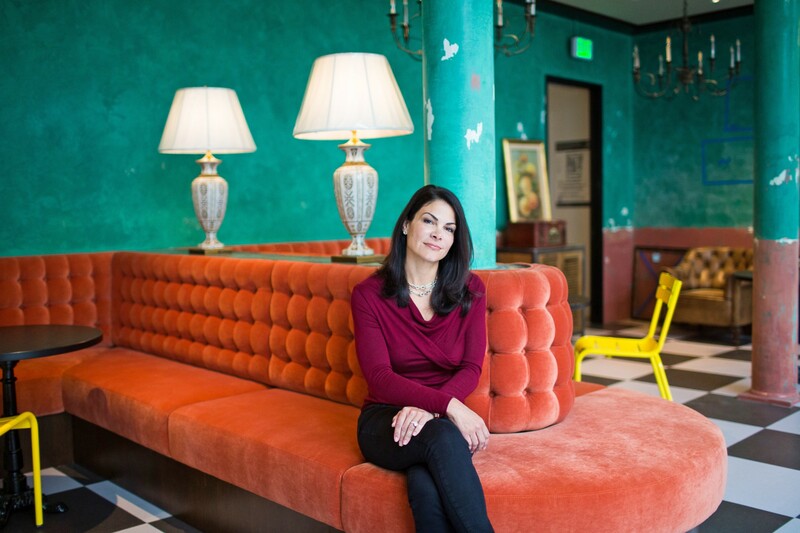 Airbnb’s Chief Business Affairs and Legal Officer Belinda Johnson in the new Cuba inspired room at headquarters in San Francisco on June 29, 2016. Photo by Michelle Le. Belinda Johnson is the brain behind the $25 billion startup’s attempts to befriend everyone. Belinda Johnson knew a decision needed to be made quickly. She pulled her boss, Airbnb CEO Brian Chesky, into a small conference room in the company’s highly designed downtown San Francisco headquarters. At issue was a new local rule requiring hosts to register with the city; most had ignored it. Now San Francisco supervisors planned to fine the home-sharing website $1000 per day for each unregistered host. At 49, Johnson has ascended to become chief business affairs and legal officer — the de facto number two at the company. A lawyer with more than two decades of experience building internet companies, she joined Airbnb in 2011 as Chesky’s first executive hire, and from the start, she encouraged Chesky to get to know regulators before conflicts even arose. She is largely responsible for the fact that Airbnb is a company that makes love, not war — especially when it fights. Under her watch, the company has created a cultish social movement around its efforts to connect strangers and foster cultural belonging. While Uber drivers fight the ride-sharing company through lawsuits, Airbnb hosts attend annual revival-like conferences (and pay for the privilege) and call their local officials to show support for the company. “She really taught me that you always talk to people. She was like the secretary of state,” says Chesky. This let’s-hash-it-out approach, masterminded by Johnson, has grown Airbnb from the brainchild of its trio of youthful founders (Chesky, chief technology officer Nathan Blecharczyk, and chief product officer Joe Gebbia) into a $25 billion business. Many of Silicon Valley’s most successful companies trace their explosive growth to this type of strong founder-operator relationship. Everyone knows the story of Mark Zuckerberg and Sheryl Sandberg, the founder and chief operating officer who together are responsible for Facebook’s success. That relationship is unique in that both have big public profiles. More often, in the most successful founder-operator relationships, the business person works quietly behind the scenes. Steve Ballmer was a relative unknown until Bill Gates handed him the CEO throne. No one knew much about Tim Cook until Steve Jobs died. So when Johnson told Chesky the company needed to sue the city of San Francisco, he listened. She explained that the ordinance would be awful for Airbnb. Sure, it would be expensive, either to pay the fines or to hire folks to enforce the registration requirement. But much worse, it could set a damaging precedent that could then be adopted in several more of the 190,000 cities where Airbnb operates. And it made things much harder for Airbnb’s San Francisco hosts. “She said, ‘I don’t think we have a choice,’” Chesky remembers. On June 27, Airbnb filed its first lawsuit. 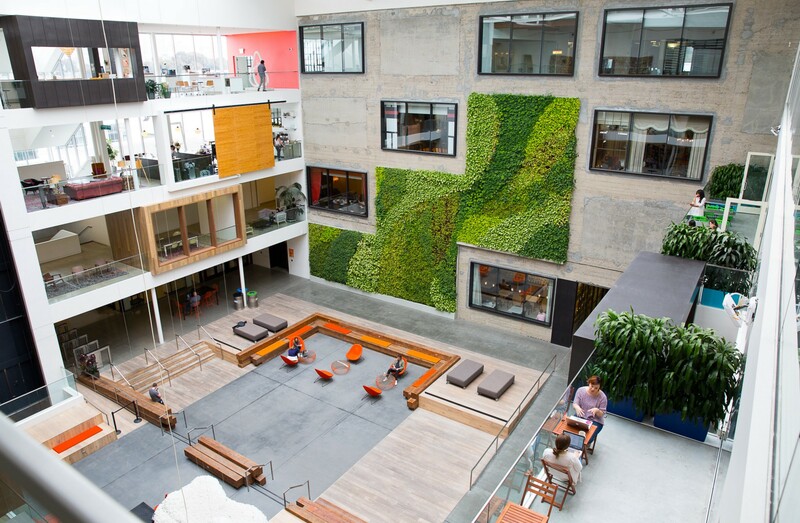 Airbnb’s Belinda Johnson walks through the hall of the newly constructed second floor at headquarters in San Francisco on June 29, 2016. Photo by Michelle Le. Johnson is two inches shorter than Chesky. She’s got long black hair and dramatic eyebrows that frame permanent twinkling eyes. 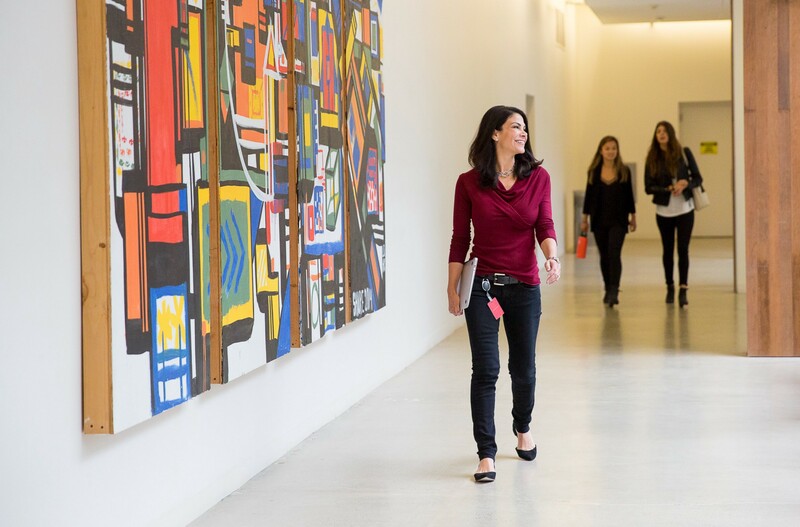 She often wears jeans, as befits the SoMa work culture, but they’re black fitted designer jeans, and she pairs them with heels instead of sneakers. It’s easy to talk with her. When I interviewed her, she sat back in her chair, and at one point drew her legs up beneath her. She is an exacting listener, and when she speaks, she is deliberate with her words. When she tells stories about the work she does, she almost always deflects, instead talking about other people. Ask her how she manages a hypergrowth strategy, and she says, “I have lots of colleagues and we work on that together.” Ask her about a new product she oversaw, like, for example, the host protection insurance program the company launched in January, and she’ll praise the person who reports to her: “Oh, Sharda did an amazing job on that!” she’ll say, referring to deputy general counsel Sharda Caro. Johnson’s guiding belief is that conflict can be resolved through dialogue. When she first arrived at Airbnb, the New York attorney general was already looking into the site’s business practices and a law had just been passed in New York that declared many apartment rentals of less than 30 days illegal. The founders were feeling defensive. “Early on, I had an instinct we should fight cities,” says Chesky. She encouraged him to approach the cities in which they wanted to operate — places like Paris and London and Washington DC — even before Airbnb expanded there. “She reminded me there’s a time for that, but you’re in these cities and you have to collaborate with them. It really changed my point of view,” says Chesky. Johnson didn’t set out to build Internet companies. When she was in school, she didn’t even have an email address. The daughter of a mortgage banker who went on to start his own data storage company and a homemaker who sometimes worked in real estate, she moved to Texas in the fourth grade. She completed a law degree at the University of Texas in Austin in 1991, and spent several years working at traditional law firms in Dallas. Billionaire entrepreneur Mark Cuban, whom you may now know from ABC’s Shark Tank, was just starting an internet radio streaming company called AudioNet in a small warehouse in Dallas. Internet companies were unusual back then, especially outside of Silicon Valley, and especially for lawyers, who tend by their nature to be risk averse. But Johnson’s curiosity was piqued. “I reached out to those guys and said, ‘Hey! You need a general counsel,’” she said. “I didn’t even understand exactly what they were doing, but I was excited by tech.” She talked Cuban and his cofounder, Todd Wagner, into hiring her, and became the company’s general counsel and corporate secretary. AudioNet, which was later renamed Broadcast.com, became popular fast, and went public in 1998. A year later, Yahoo paid $5.7 billion for the company, and Johnson moved to the Bay Area to work there. She spent a dozen years at the internet company, including ten as deputy general counsel for product, litigation and privacy. While at Yahoo, she fought off a copyright infringement suit from Sony BMG, helped the company navigate online privacy issues, and worked on regulatory clearance of a Microsoft search agreement and other big deals. By 2011, Johnson was ready for something new. She wanted to join a small consumer-facing startup and once again experience the hypergrowth for which she’d gotten a taste at Broadcast.com. Once she heard about Airbnb, she was sold. Johnson began casting about for a way to get introduced to the founders. It wasn’t easy. She finally tracked down investor Ron Conway, who made the introduction. (Conway writes on Johnson: “Cool, calm, and collected and smart and a leader !!!!!!!!!!! !”) When it comes time for startup founders to build a team of senior executives, they rarely start with the general counsel. But the company had already begun to bump up against regulatory issues. Chesky understood he needed help. Johnson knew she’d made the right choice shortly after she started with the company. She attended a 2012 San Francisco tax hearing. That was in the early days, when Airbnb still felt like it was nine parts social movement, one part business. Dozens of hosts had come to defend the practice. “The room was so crowded they had to open an overflow room just to accommodate everyone who had been waiting to speak at the podium,” she said. She was impressed by the supporters’ passion. To a lawyer in pursuit of a massive challenge, it was a dream. Johnson with Airbnb CEO Brian Chesky. Photos by Michelle Le. I visited Airbnb in late June. The night before, Johnson and Chesky had gone to dinner at Bellota, a Spanish-style restaurant that had just opened in the company’s airy lobby. When they walked in, the host showed them to a prominent table just outside the kitchen, where they could watch the chef, and other diners could watch them watching the chef. Even before Chesky said something, Johnson knew he’d hate it. So they asked for a back booth where they could talk quietly. They go to dinner weekly because it buys them time to sink into longer conversation. They occasionally get off track, talking about exercise — Chesky is a body builder in his spare time and likes to poke fun at Johnson for being more of a P90x person, meaning a lightweight. But they turn back to company issues quickly. These one-on-one meetings rarely happen during the day. Things move too fast. So this is the time they reserve for hashing out company strategy. They also spend their dinners working on strategies to help Airbnb run well as it grows. Now that the company has ballooned to 2500 people, 1100 of whom came on in the last year, they’ve had to figure out how to communicate more quickly. Chesky and Johnson have brought back a Thursday afternoon all-hands meeting, which had slipped to biweekly. And they’ve recently introduced a weekly 100-person meeting attended by all the executives’ direct reports. “It’s new, we’re still getting the hang of it,” says Johnson. On first blush, it seems like a counterintuitive way to work in a startup culture where the dominant viewpoint is that smaller teams move faster. But by making the big company decisions in front of as large an audience as possible, Johnson and Chesky hope to ensure everyone is working with the same information as they go about running their parts of the business. They hope it will streamline communication and make the organization feel flatter for longer. Johnson also endeavors to empower the people beneath her to make decisions. That’s by design. “As a company grows, things get stuck at the top, it can be a bottle neck,” she says. She takes a long time to make a hire — as she considered Chestnut for the general counsel position, she had six meetings with him over the course of five months. But once she’s bestowed her confidence in colleagues, they are given great reign to make decisions. Airbnb’s General Counsel Belinda Johnson in the Founders’ Den at headquarters in San Francisco on June 29, 2016. Photo by Michelle Le. After years of working behind the scenes, Johnson made her public debut to the Airbnb community last November at the company’s second annual host conference. More than 5,000 enthusiasts had traveled to Paris and paid $295 to attend the three-day event, which took place inside the Parc de la Villette. They came to learn how to be smarter about profiting from the Airbnb site. And they came to feel that they, too, were part of a movement that Airbnb had inspired, a legit bottom-up cultural exchange. Though Johnson came off well onstage, she exhibited a deeper leadership the next day. She was at a dinner with roughly 50 Airbnb employees at a bar they’d rented out in the 18th arrondissement. Chesky was eating a couple miles away with his cofounders, his parents, and a number of early employees. It was the end of their second day, and everyone was still riding the wave of purpose and success and potential when shortly after 9pm, gunfire and explosions began to ripple through the city. At first, it wasn’t clear what was going on. But within a short period, terrorists were attacking sites all over the city. Johnson could hear the sirens, and a note flashed across her iPhone advising Parisians to shelter in place. “It was surreal,” Johnson remembers now. “You don’t have time to grasp it fully, because you need to make sure that everyone is safe.” The bartender was also an Airbnb host, and he opened up an empty apartment above the bar to serve as a command center. Johnson texted her family to let them know she was okay, and then she began to organize. As the night unfolded, she convened a call with the founders and senior leaders every twenty minutes. They made sure all 635 employees on the ground in Paris were accounted for, and all 5,000 hosts. They hunkered in place until the violence had dissipated and they knew every last host and employee was safe. The bartender stuck around, keeping the lights on. That evening, Johnson put employees into cars, one by one. Around 3am, she was among the very last to leave. The world has become more complex since Johnson first signed on to work with Airbnb’s founders. The day I visited, terrorists armed with guns and explosives killed 36 people in the Istanbul Ataturk airport, another echo of the events in Paris. Everywhere you look, it would seem that there are good reasons to be afraid of strangers. Meanwhile, Airbnb’s relationships with regulators are also growing more complex. As the service becomes mainstream, city officials are paying more attention to its impact on their communities. Airbnb’s lawsuit against San Francisco likely won’t be its last. But perhaps Airbnb’s most challenging complexity is internal as the company grapples with the unintended consequences of building a platform on which the expectation is that human beings are fundamentally good. A recent Harvard study has exposed racist practices occurring on the platform. This constitutes a crisis for Airbnb, which has built its mission around breaking down cultural barriers, not reinforcing them. As these forces amplify, Johnson is doubling down on her signature diplomacy. Johnson is working with outside partners to eradicate discriminatory behavior on the platform. She and Chesky discuss this every day, and they hope to have a plan for what to do about it by September. In response to increasing regulatory concerns, she’s cultivating host clubs. Right now, Airbnb boasts 64 such groups. After the Chicago host club made 42 visits to legislators and 1,500 phone calls to elected officials, Chicago passed a set of Airbnb-friendly regulations that allow the company to continue to operate in the city. The company is also reported to be raising another round of funding, this time at a $30 billion valuation. If it’s successful, the raise would allow Airbnb to delay an initial public offering a bit longer, which might give it more time to resolve these issues. As for the larger global threats, I ask Johnson whether they pose a challenge to Airbnb’s business. We’ve finished our interview, and I’ve just gotten an alert on my phone from the New York Times as new details about the morning’s airport bombing emerged. The question is more of an afterthought. “It makes our social mission more important,” says Johnson, adding that there has never been a more critical time for cultural exchange. It’s a very Belinda Johnson way of looking at things: help people to talk to each other. Creative Art Direction by: Redindhi Studio. Thanks to Sandra Upson and Steven Levy.